These are among the findings of the most up-to-date analysis of national data on the pervasive contamination of drinking water with atrazine, the second-most widely used weed killer in America. EWG’s Tap Water Database, which aggregates water testing data from utilities nationwide, shows that nearly 30 million Americans in 28 states have some level of atrazine in their tap water. Environmental Protection Agency data for 2017 show late-spring and early-summer spikes of atrazine in drinking water commonly are three to seven times higher than the federal legal limit, but these exceedances are not reported to people in the affected communities. Studies in Ohio and three other Midwestern states find that elevated exposure to atrazine in drinking water during pregnancy increases the risk of preterm delivery and of lower birth weight in the newborn child. Studies of people and laboratory animals have shown that atrazine and related chemicals harm the reproductive system and disrupt the nerve and hormone systems, affecting one’s brain, behavior and crucial hormones such as estrogen, testosterone and dopamine. In 2016, California state scientists listed atrazine, simazine and related chemicals as substances known to cause reproductive toxicity. The European Union completely phased out atrazine in 2003 because of its potential to contaminate drinking water sources. Yet in the U.S., the EPA continues to allow the pollution of drinking water with atrazine and similar weed killers. Source: EWG, from the EPA’s Atrazine Monitoring Program data. Atrazine is the second-most common herbicide used in the U.S., with more than 70 million pounds sprayed in 2016. Only Monsanto’s signature herbicide Roundup, or glyphosate, is more heavily used. The EPA’s legal limit for atrazine in drinking water is three parts per billion, or ppb.1 The EPA data show that last year, water utilities in Illinois, Kansas, Kentucky and Ohio had atrazine spikes much higher than the federal legal limit for the chemical. The two highest spikes were reported in Evansville, Ill., at 22 ppb, and Piqua, Ohio, at 16 ppb. Yet the outdated Safe Drinking Water Act allows utilities to report only annual averages of testing for the chemical, keeping them under the legal limit but masking the presence of the atrazine spikes. Some of the utilities with elevated levels do not even test for atrazine during periods of spikes. 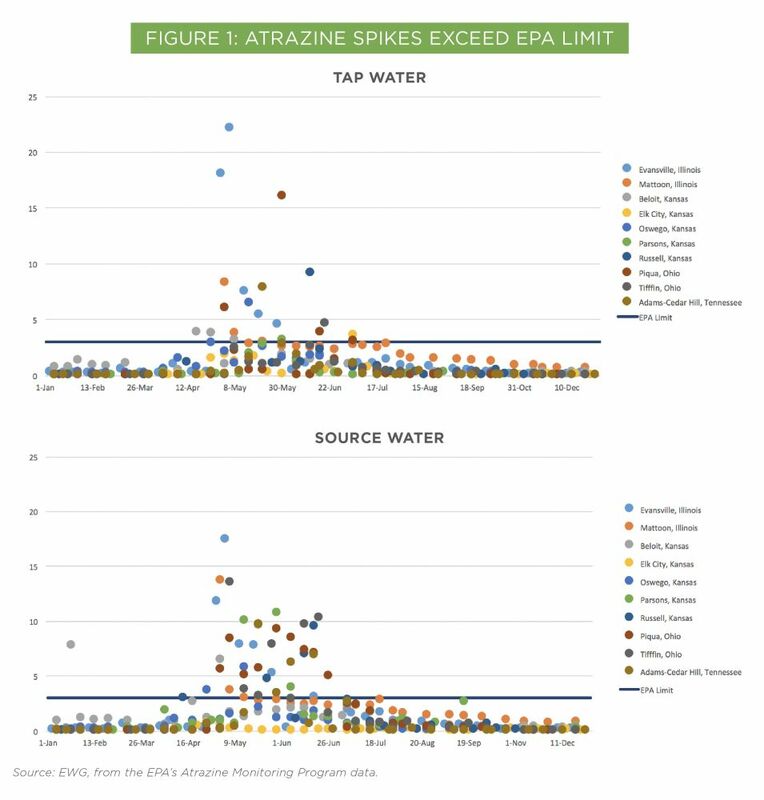 EWG analyzed the EPA data for atrazine spikes and annual levels for 10 public water systems serving communities listed in Table 2, all of which had at least one test result exceeding the federal legal limit. Average annual levels for these systems were between 0.4 and 2.20 ppb, obscuring the spikes in spring and summer. Although short term, these hidden spikes can present health risks, particularly for the developing fetus. 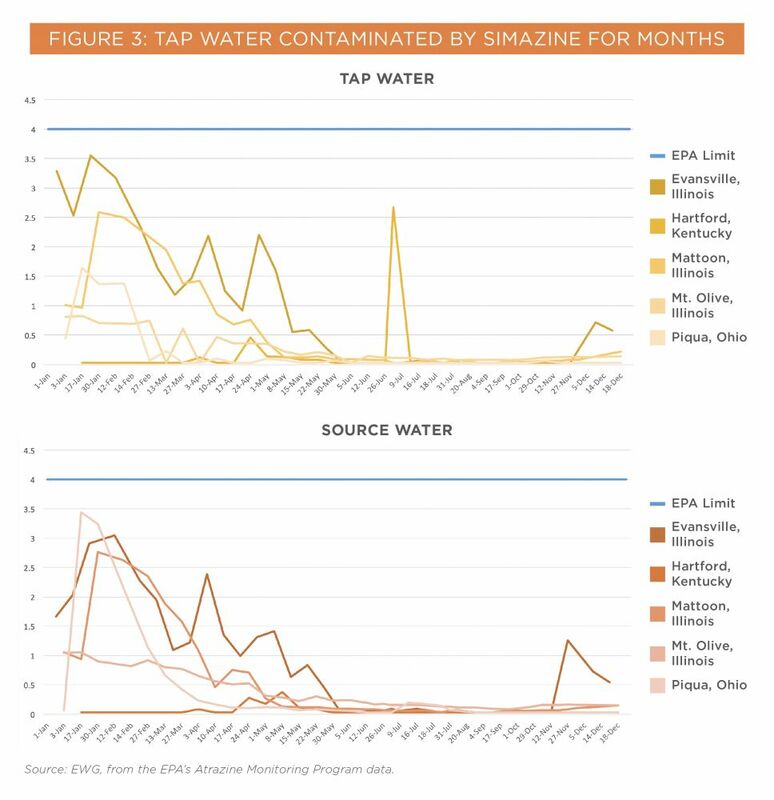 A closer look at the EPA data shows that in some communities, the atrazine levels in tap water track closely the atrazine load in their drinking water sources, indicating that the water treatment systems installed in these communities are failing to remove atrazine. 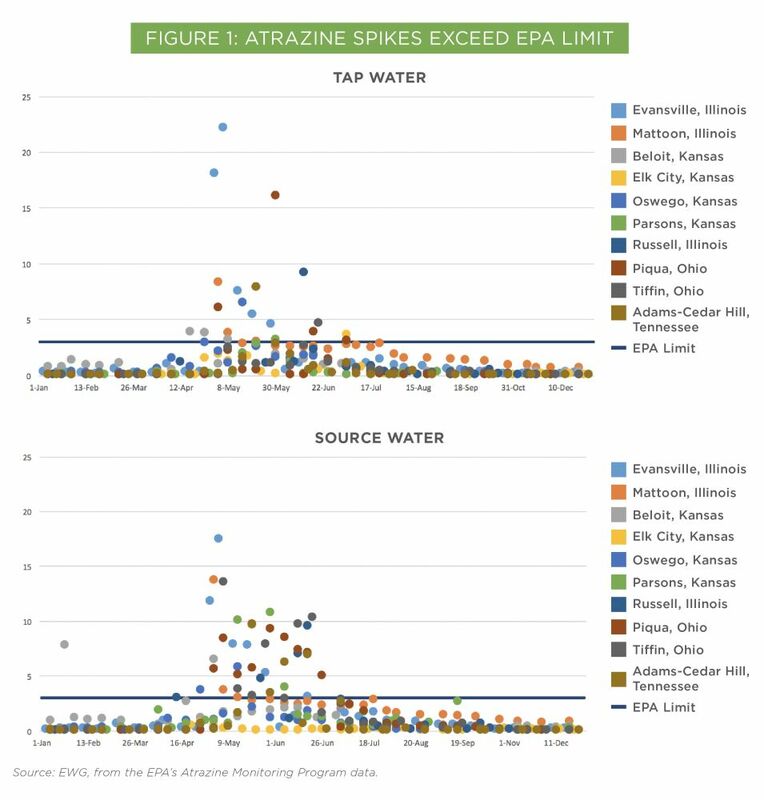 EPA’s Atrazine Monitoring Program tests in very few utilities. By contrast, all community water systems are required to test tap water for atrazine and report results to state drinking water agencies. But in another glaring shortcoming of federal regulations, systems are not required to test when a contaminant spike occurs. Instead, it is perfectly legal to test tap water for atrazine at a time before or after the contamination spike has occurred, which creates a false image of safety. EWG compared the data utilities reported to state authorities with the EPA monitoring data for the same utilities. What we found was alarming: For seven out of 10 utilities analyzed, the utilities’ tests were either conducted entirely outside periods of the atrazine spikes, or the reported levels were below what the EPA tests found. 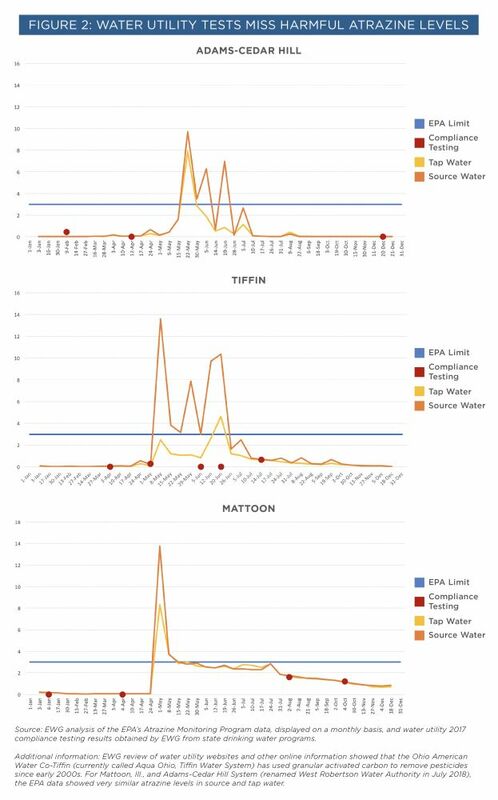 Utility tested water during the atrazine spike? # Community population information obtained from DataUSA. ## Data source: EPA’s Atrazine Monitoring Program, available at https://www.epa.gov/ingredients-used-pesticide-products/atrazine-monitoring-program-data-and-results. 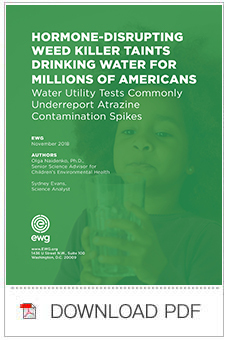 According to EWG’s Tap Water Database, which aggregates testing data from utilities nationwide, in 2015, atrazine was found in water systems serving nearly 30 million Americans in 27 states. EWG’s data show that the largest number of utilities with atrazine contamination were found in Texas, with 472 systems. Next were Kansas (233 systems), Missouri (160 systems), Illinois (128 systems) and Ohio (90 systems). If the pattern of failing to test during spikes and/or underreporting of actual test results as found by the EPA monitoring program is as common nationwide, many more Americans are routinely exposed to elevated levels of atrazine. In 2013, Syngenta, the main manufacturer of atrazine, settled for $105 million a class action lawsuit brought by water utilities in Illinois, Iowa, Indiana, Kansas, Missouri and Ohio that sued Syngenta over contamination of their drinking water sources. The settlement money was distributed to communities with the most contamination, but for many systems, that amount was insufficient to cover costs of long-term water treatment. Atrazine can be removed by treating the water with granular or powdered activated carbon, and several utilities in the EPA’s monitoring data for 2017 dataset use such treatment to decrease atrazine levels in their tap water. The EPA data also show that simazine, another hormone-disrupting herbicide related to atrazine, appears in drinking water during winter months, at levels below the federal legal limit of 4 ppb. The EWG national Tap Water Database shows that in 2015, simazine was found in water systems serving 13 million Americans in 16 states. In 1999, the California Office of Environmental Health Hazard Assessment set a public health goal of 0.15 ppb for atrazine in drinking water, a figure based on a study finding increased rates of breast cancer in rats exposed to the chemical. This health benchmark applies to lifelong exposure to atrazine from drinking water and is one-twentieth of the current legal limit. Yet the latest EPA assessment of triazine herbicides, such as atrazine and simazine, continues to deny their risk to human health, leaving communities in affected areas to fend for themselves. In a move that echoes pesticide industry wishes, the EPA disregarded the latest research, ignoring more than 10 human epidemiological studies showing human health harm from atrazine in drinking water, and dismissed the children’s health impacts from atrazine and related herbicides. Two recent studies examined the effects of atrazine in drinking water on newborn babies. A study published in 2017 in the journal Environmental Research examined the data for almost 135,000 children born between 2004 and 2008 in 46 rural counties in Ohio, Indiana, Iowa and Missouri. The study found that exposure to atrazine in drinking water above 1 ppb during pregnancy increased the risk of preterm delivery. A study published this year in the International Journal of Environmental Research and Public Health examined the data for about 15,000 children born between 2006 and 2008 in 22 Ohio communities in the EPA’s monitoring program. The study found that the presence of atrazine in the mother’s drinking water in the range of 0.15 to 5.9 ppb increased the risk of low birth weight in newborns. These findings specifically accounted for atrazine exposures during the first and second trimester of pregnancy. EWG scientists used this latest epidemiological data to define a health-protective benchmark specifically for the period of pregnancy when the developing fetus is most vulnerable to the effects of hormone-disrupting chemicals. Our calculations started from an atrazine concentration of 1 ppb, a level associated with a greater risk of preterm delivery, and including an additional 10-fold safety factor supported by the federal Food Quality Protection Act. This approach results in a concentration of no more than 0.1 ppb for atrazine, simazine or related triazine chemicals. This health benchmark is 30 times lower than the federal limit for atrazine and 40 times lower than the limit for simazine. The long-term solution to contamination of drinking water by atrazine and other pesticides can only come from agricultural best practices for minimizing agricultural chemical runoff. Protecting water sources and watersheds from pesticide pollution is smart economics. Keeping contaminants out of water in the first place is more cost effective than removing them year after year. Measures such as establishing and maintaining buffer zones of grasses along rivers and streams can be highly effective at preventing farm pollution from entering sources of drinking water. Some states, including Nebraska and Kansas, have published guidance for farmers on reducing atrazine pollution of drinking water sources. EWG believes that Congress should fully fund incentives to adopt conservation practices that reduce pesticide runoff and make drinking-water protection a priority. So long as hormone-disrupting crop chemicals contaminate drinking water, it is essential for families and communities to look for ways to safeguard their own health, especially when pesticide levels in their water are high. Atrazine and similar herbicides can be removed from tap water by carbon filters, including inexpensive countertop pitchers and faucet-mount filters. These filters are particularly important and effective for minimizing the spikes of atrazine and simazine from drinking water. If you have, or suspect you might have, contaminants in your tap water, EWG’s Water Filter Guide can help you identify available options for water filters. In the meantime, EWG, together with thousands of our supporters, is demanding that the EPA enact a complete ban on atrazine. One part per billion is about one drop of water in an Olympic-size swimming pool.